Only barbless hooks may be used for all salmon and sea-run trout fishing. Practice safe and responsible release techniques to ensure salmon survival. Before packaging your fish, always ensure the species, number, size, and weight of the fish can be readily determined. 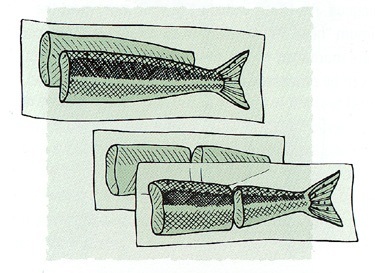 When packaging your salmon catch, if a maximum size limit applies, the head and tail must remain attached until you prepare and consume your catch, arrive at your ordinary residence, or deliver your catch to a registered processing facility. 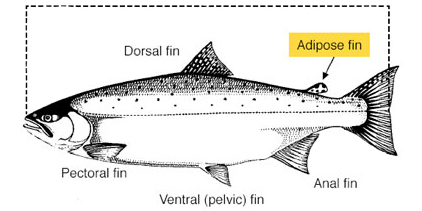 the number and species of salmon - e.g., "one Chinook"
the number of fillets - "two fillets"
Missing fin? Keep the head. The exception to the above requirements is if your coho or chinook salmon is a hatchery fish with a healed scar in place of the adipose fin. Remove heads from hatchery coho and chinook and submit them to a Salmon Head Recovery Depot to provide valuable recreational catch monitoring information to DFO. Anglers are required to ensure that proof of the healed scar remains clearly distinguishable after packaging by leaving the portion of the fish that contains the scar on the fillet. The healed scar will identify the fish for enforcement officers as a hatchery fish. When steaking a salmon in preparation for transport do not cut all the way through the fish. Leave the steaks connected by a piece of skin and place waxed paper or plastic film between each steak. Similarly, the tail must remain attached to the body of the fish by a piece of skin. 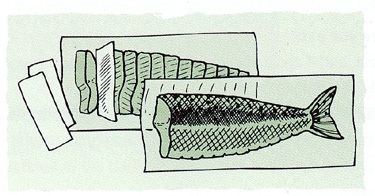 The fish can then be wrapped as a whole fish and later steaks can be removed as required without thawing. When packaging salmon for guests, lodges and charter operations are to clearly provide the following information on the outside of the transport box. the number of fish by species and number of packages. For example, the label on the outside of the cooler should state, in the case of two packaged Chinook or two packaged halibut: "2 Chinook - 2 packages", or "2 halibut - 8 packages"
When individuals are transporting or shipping fish they must package their fish separately and only have one name per package. However, they may share a container. It is recommended that the contents (number of fish, species, and number of packages) be listed on the outside of the container to facilitate inspection. It is recommended that you store and transport your catch in containers and packages intended for food. Missing fin? Keep the head! If you catch a "marked" fish - one with a healed scar in place of the adipose fin (coho or chinook), remove the head and submit it to a Salmon Head Recovery Depot, with a completed sport head label (available at the Depot). Once the head is dissected you will receive information about your catch. Contact the Salmon Head Recovery Program for more information. Why participate in sport head recovery? By participating in the Salmon Head Recovery Program, you will be contributing necessary information to allow for continued sport fishing opportunities. In some cases, certain hatchery stocks are used to indicate the health of other stocks in the area. Tag recoveries not only help to indicate that stocks are healthy, but also that stocks of concern could be improving. In addition to marking hatchery salmon, a very small number of wild coho and chinook (less then 5%) are also tagged and adipose clipped to help biologists monitor habitat enhancement projects associated with wild salmon stocks. It is just as important to turn in heads from terminal or freshwater sites as it is from marine areas. Even though anglers fishing close to hatcheries can be fairly certain of the origin of their catch, data will not be recorded unless the heads from fin-clipped recoveries are turned in. Without the data, the health of the stock and the value of the resource to anglers could be underestimated. We use tagging programs in BC to study the migration and growth of salmon. This involves attaching numbered tags to fish, usually located near the dorsal fin. Peterson tags: Small round plastic disks. Report: If you discover an external tag on your catch, report the number along with information on where the fish was caught to your nearest DFO office, or mail it to: Doug Herriott, Pacific Biological Station, 3190 Hammond Bay Road, Nanaimo, B.C. V9T 6N7. Should you find a PIT tag, turn it into your local Fisheries and Oceans office and include details of where and when the fish containing the tag was caught. What is the Atlantic Salmon Watch Program? The Atlantic Salmon Watch Program (ASWP) is a research program operated by Fisheries and Oceans Canada. The purpose of the program is to study the abundance, distribution and biology of Atlantic salmon in British Columbia and its adjacent waters. The ASWP monitors reports from commercial and sport catches and observations of Atlantic salmon throughout British Columbia. The program relies on recreational and commercial fishers, fish processors, government and independent field staff and hatchery workers to report observations of Atlantic salmon. How do you distinguish Atlantic salmon from Pacific salmon? What should I do if I catch an Atlantic salmon? Keep the fish and report the capture by calling the ASWP toll-free reporting line at 1-800-811-6010. You will be asked where and when you caught the fish and if you wish to donate the fish or part of it for research purposes. Donation is not mandatory but it does provide valuable samples for our scientific study. For whole fish donation, the entire fish, including entrails, should be frozen or kept on ice. Alternatively, the head and a small portion of the back including scales can be preserved. ASWP staff will arrange for transport of the sample. Report all captures of Atlantic salmon to: 1-800-811-6010 (toll-free).